One step closer to healthy feet. More than a million diabetic foot ulcers occur in the US annually. In the year after healing from an ulcer, as many as 40% of patients will reulcerate. Podimetrics is here to help. 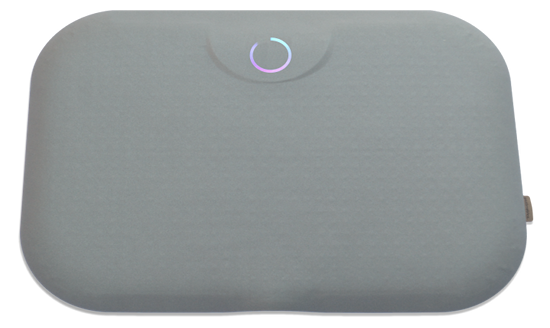 The Podimetrics Mat™ is a wireless, in-home monitoring technology that collects foot temperature scans. Step on it for twenty seconds a day and we'll take care of the rest. Your toes will thank you. How are your patients' feet today? Podiatrists are crucial allies in the fight against diabetic foot ulcers. 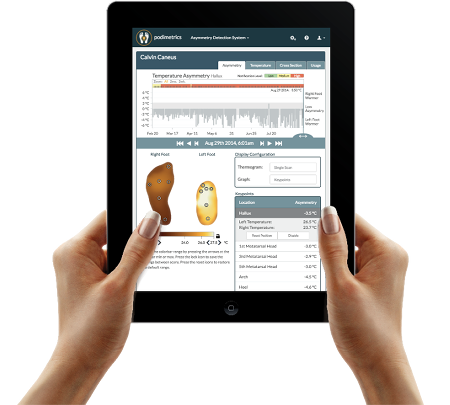 Podimetrics offers online tools for clinical decision support and population management so you can focus on the patients who need care most. Diabetic foot ulcers are a major complication of diabetes. Foot ulcers are the leading cause of below knee amputations, and a single episode can cost more than $20,000. One in every three dollars spent on diabetes is linked to foot ulcers, necessitating prevention technologies. Foot temperature monitoring is recommended by the International Working Group on the Diabetic Foot and the American College of Foot and Ankle Surgeons for preventing diabetic foot ulcers and other inflammatory foot diseases. The RTM System™ makes it easy to monitor foot temperature. The RTM System™ was designed with the patient and home in mind. It works out of the box with no setup. It only takes twenty seconds a day to use, and the collected temperature scans are automatically sent to Podimetrics and the care team for analysis and review. Diabetic foot ulcers are a major complication of diabetes. Foot ulcers are the leading cause of below knee amputations, and a single episode can cost more than $20,000. One in every three dollars spent on diabetes is allocated to foot ulcers, necessitating prevention technologies. The RTM System™ was designed with the patient and home in mind. It works out of the box with no setup. It only takes twenty seconds a day to use, and the collected temperature scans are automatically sent to Podimetrics and the patient's care team for analysis and review. A world without foot ulcers. We're looking for partners to help make this a reality. If you're a health plan or provider interested in piloting Podimetrics technology, or are interested in learning more about the RTM System™ or thermometry science, please contact us at info@podimetrics.com. We'd love to hear from you. We're looking for partners to help make it a reality. If you're a payor or provider interested in piloting Podimetrics technology, or are interested in learning more about the RTM System™ or thermometry science, please contact us at info@podimetrics.com. We are engineers, doctors, and entrepreneurs who are dedicated to a world without diabetic foot ulcers. We have experience in patient care, medical device development, sensor technology, user-experience, data-driven analytics, machine learning, and health monitoring. 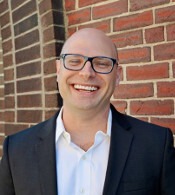 Jon is a board-certified physician with over 15 years of experience in healthcare delivery, patient monitoring, medical devices, and biomedical research. Prior to Podimetrics he was an anesthesiologist at the University of Pittsburgh Medical Center, the Director of Medical Affairs for Covidien's Respiratory and Monitoring Solutions division, and a student at the MIT Sloan School of Management. David holds a Master's in Mechanical Engineering from MIT and an MBA from MIT's Sloan School of Management as part of the Leaders for Global Operations Program. He previously helped develop an implantable device for lung cancer radiation guidance at Calypso Medical (now owned by Varian Medical Systems) and co-founded and led technology development at LiteTouch, a sensor company for physical therapists. 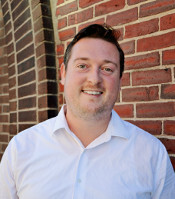 Brian brings experience leveraging advanced analytics and machine learning techniques to address technical and business challenges. He is a full-stack developer with experience building web applications and intuitive user interfaces. He is a graduate of the MIT Leaders for Global Operations program with an MBA in operations management and a Masters degree in Engineering Systems. 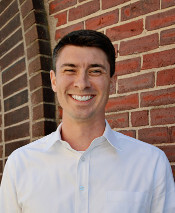 Ryan is an international business development leader with 8 years of experience bridging the needs of customers with innovative and transformational solutions. He is passionate about commercializing new technology to improve people’s lives. Prior to Podimetrics he was Director of Business Development at LiquiGlide, an MIT material science start-up, where he crafted commercial strategy, developed strategic business opportunities, and managed key client relationships. He holds an MBA from Rice University's Jesse H. Jones Graduate School of Business. 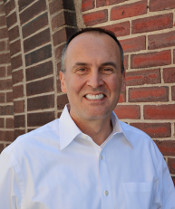 Mike is an operations executive with over 20 years of industry experience. He holds a Bachelor's Degree in Mechanical Engineering from the United States Military Academy at West Point and has held a variety of manufacturing, quality, and product development leadership roles at start ups and large medical device companies. Dr. Armstrong is a Professor of Surgery and Director, SALSA at The University of Arizona College of Medicine. He has produced over 450 peer-reviewed research papers and over 75 book chapters' edits of the American Diabetes Association's Clinical Care of the Diabetic Foot. Dr. Armstrong is the recipient of numerous international awards and was the 25th and youngest-ever member elected into the Podiatric Medicine Hall of Fame. He is the Chair of Scientific Sessions for the ADA's Foot Council, and a past member of the National Board of Directors of the ADA. Dr. Armstrong sits on the Infectious Disease Society of America's Diabetic Foot Advisory Committee. Professor Herzlinger is the Nancy R. McPherson Professor of Business Administration at the Harvard Business School. She was the first woman to be tenured and chaired at Harvard Business School and the first to serve on a number of corporate boards. She is widely recognized for her innovative research in health care, including her early predictions of the unraveling of managed care and the rise of consumer-driven health care, a term that she coined. Money has dubbed her the "Godmother" of consumer-driven health care. She is currently completing two text and cases books on Innovating in Health Care, one for the life sciences and the other for health care insurance and delivery. Dr. Manberg has over 35 years of experience managing the regulatory and clinical development programs for a wide range of medical device and pharmaceutical products. He has designed and executed numerous US and international multicenter clinical trials, leading to successful product registrations and market adoption activities and held executive positions at Ares-Serono, Aspect Medical Systems, and Covidien. Dr. Manberg received his Bachelor’s degree in Biology from SUNY-Binghamton and his PhD in Pharmacology from the University of North Carolina School of Medicine. Dr. Bharara is a former Research Scientist at the Southern Arizona Limb Salvage Alliance (SALSA). He is an accomplished author and serves on the editorial board for Journal of Diabetes Science & Technology, Ostomy Wound Management, and Pan American Journal of Medical Thermography. Dr. Bharara holds a PhD in Biomedical Engineering from Bournemouth University (UK) and an MBA from the University of Arizona's Eller College of Management. Dr. Lakhani is a board-certified surgical podiatrist who has spent 15 years preventing and treating diabetic foot ulcers. She is a passionate social entrepreneur with a focus on medical economics and global health. To that end, she began and assisted with projects to improve community health outcomes in Africa, Europe, India and Jamaica. She is a recent student at Harvard obtaining a Master's of Science in Healthcare Management. 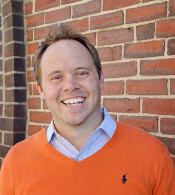 Jeff was founder at MatchLend, a big data startup that won the 2011 HBS MVP Contest. Previously, he worked for Unitus, an Indian social enterprise, and Lehman Brothers, an investment bank. He has a BA in history from Columbia College and an MBA from Harvard Business School. Podimetrics is proud to be affiliated with the following organizations.